Physical Characteristics: Deciduous tree that averages 40 feet in height and 25 feet wide at maturity. Many branches give tree irregular look. Flowers are greenish, tipped with purple, and grow in tight clusters surrounded by 4 – 7 large, showy, white bracts. Clusters of bright red, drupe-shaped, half-inch long berries follow flowers and ripen in October. Leaves are elliptical, sharp-pointed at tip and tapered at base, with slightly wavy margins. Green leaves turn a pinkish-red in autumn before falling. Habitat: Species prefers low elevations of moist, well-drained sites, often along streams or gullies, in open to fairly dense, usually mixed forest. Range: Native to Pacific coast from southern British Columbia to northern California. Clearwater Basin is only place in world where species occurs inland. Found along lower Lochsa and Selway Rivers. Inland population classified as Coastal Disjunct species, was once part of continuous coastal habitat now separated by Cascade Mountains. Reproduction: Flowers in spring and occasionally repeats in early fall. Propagated from seed, bare root or by cuttings. Threats: Introduced fungal disease (first noted in 1976) anthracnose devastated Idaho populations. Habitat loss due to deforestation/logging. Climate change may potentially alter natural climatic range. Listed as Species of Concern by Forest Service Region 1. Miscellaneous: Indigenous people used close-grained, extremely hard wood for bows, arrows, tool handles, and hooks. Because of tannin bark was boiled for rich, dark brown dye and also used as preservative. Branches were woven into baskets. Medicinally speaking preparations were used as blood purifier, for strengthening lungs, and as treatment for stomach ailments. 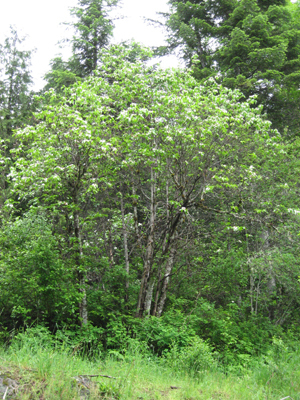 Pacific Dogwood blossom is floral emblem of British Columbia. Learn more about Coastal Disjunct.